Welcome! I’m so glad you’re here. I’m Amanda Hirsch, and Having it Alt is my personal blog and labor of love chronicling my efforts at living authentically. Read on to discover the beliefs behind Having it Alt and to learn about who I am. I wish our education system did more to help us come alive. I wish we learned in school how to be mindful and resourceful — to tune into what we want and develop the agency to go get it. There is no more essential life skill. There’s innovation around the edges, and maybe one day, we’ll get there. But for now, many of us, as adults, need to be autodidacts when it comes to living richly authentic lives. This blog chronicles my journey in authenticity. The ups and downs. The moments of insight and joy and the moments of confusion and loss. Usually what I write is intensely personal, based on the belief that baring our souls is essential to finding our way on these journeys of ours. I write about everything from motherhood to being an artist. I share thoughts on identity and self, and these days, I write about what it means to live in Trump’s America (shudder). I’m an improv actress and you’ll see plenty of humor sprinkled throughout, but this isn’t a humor site. It’s earnest and searching. I write to feel less alone, and in the deep hope that my writing will help others feel less alone. Authenticity is served by deep connection. I call this site “Having it Alt” because I see it in opposition to the idea of “having it all.” “Having it all” is outward-oriented; it’s inherently about demonstrating your life to others, whereas having it alt is about going inward, in order to shine brighter. I hope you enjoy what you find here, and if you have any comments or questions, please don’t hesitate to reach out to me. Hi. 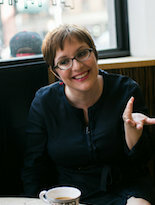 I’m Amanda Hirsch, a writer and improv actress who lives in in Brooklyn, NY. I’m married to my high school sweetheart, Jordan. We do a two-person improv comedy show called Til Death that makes fun of being an old married couple (we also wrote a piece about marriage for McSweeneys called Thoughts on Marriage from a Couple Who Have Been Married for 18 Years). None of the above pays the bills (yet), so I’m also a content and communications consultant to nonprofits, indie media companies and people I believe in, including PBS, NPR, TED, the George Lucas Educational Foundation and Sundance board chair Pat Mitchell. Jordan and I also lead workshops applying improv concepts to life and work. We have a daughter, Alison, and a rescue pup, Clover. I’m on Twitter at @amanda_hirsch and Instagram as @iamamandahirsch. I left school in the middle of a weekday, when I could no longer bear the effort of going through the motions. “You need to get on a train and go home,” my friend Kate counseled, and I did. When I came back the next semester, it was on my own terms. A teacher assigned a standard essay; I asked if I could write a play, instead. I began an independent study, which resulted in a proposal for a new writing-centric freshman course encouraging students to define what they hoped to achieve in college, and to design a course of study accordingly. I was reaching towards mindfulness, years before my first yoga class. I was making things up as I went, long before I found the art of improv comedy. I was carving my own path, for the first time. I have continued to carve my own path, shaping a life that expresses my values and passions, rather than conforming to a pre-determined script. I do not hold myself up as an example of perfect authenticity.